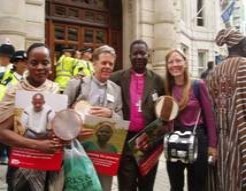 On Thursday 14 September 2006, Bishop André and fellow Angolans, along with Bishop Peter Wheatley from the Edmonton Area, marched from Lambeth to the Treasury with ALMA reps and about 3,000 Christian Aid supporters and partners. The Beat Goes On marchers were demanding that our government withhold UK payments to the IMF and World Bank until these International Financial Institutions (IFIs) stop attaching conditions to aid and debt relief that force poor countries to open up their economies before they are ready. 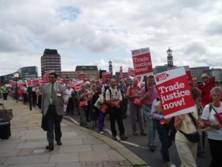 Poor countries must be allowed self-determination in the rate at which they open up to free trade. In 2005 the UK government promised to drop any such damaging conditions itself and must now use its influence within the IFIs. 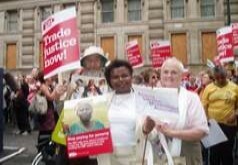 Christian Aid always asks us to work with any link partners in the South in our campaigning. ALMA reps were therefore delighted when we realized that Bishops André, Dinis and Mark were in London. Bishop Mark was unable to attend due to illness, but the Archbishop of Canterbury put in a welcome appearance. It was a colourful, good humoured and very noisy event blessed by a warm, sunny day and spirits were high after Hilary Benn’s early morning announcement that the UK government would withhold £50 million of its contribution to the World Bank in protest against the organisation’s continued use of damaging economic conditions on loans to poor countries. Daleep Mukarji, Director of Christian Aid, thanked campaigners for their support. They responded with cheers and drumming. He said, “This is excellent news and a vindication of all your hard work”. But he also noted it was a first step and the UK government must withhold the rest of its funds until the World Bank and IMF substantially reform themselves.